Fatin holds a master's degree and an undergraduate degree in public administration from University of Brawijaya. 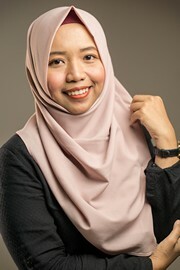 Prior to joining SMERU, Fatin worked as a Research Assistant on research project "Farmer’s Perceptions on Adopting SRC Red Calliandra" in Tohoku University. Fatin was awarded Bidikmisi scholarship program for her undergraduate study in 2014-2015. In 2014, She was awarded Best Graduate Student in Faculty of Administration from University of Brawijaya.